Scott Felder Homes, a 10-time “Builder of the Year” award winner, is offering its thoughtfully designed, energy-efficient homes at Homestead, Freehold Communities’ new master-planned community in Schertz/Cibolo. Its model home, opening this July, is the Rockwood floor plan. Combining functional and modern features, the Rockwood is a home perfectly suited for today’s families. The Rockwood floor plan, one of the many customizable floor plans offered by Scott Felder Homes, is an open-concept home with plenty of modern amenities. This single-story home is approximately 2,380 square feet and features three bedrooms, two and a half bathrooms and a two- or three-car garage, with the option of adding an additional five feet of storage space. And with four beautiful exterior styles to choose from, you will love how your home looks both inside and out. The Rockwood is an open and inviting home with spaces for entertaining and relaxing both inside and out. The open-concept kitchen and dining area, complete with granite counter tops, spacious cabinets and a large pantry, is perfect for chefs wanting to show off their skills at a dinner party or for whipping up a quick breakfast for the family before starting your day. The spacious open living area features an optional fireplace where you can hang a flat screen TV and stockings alike. It flows almost seamlessly outside to the extendable covered patio and optional cooking and grilling area, ideal for hosting dinner parties or sharing a glass of wine on a warm summer evening. And after a long day, the master suite is your very own private retreat, featuring an impressive walk-in closet, vaulted ceilings, an optional bay window and a deluxe master bath complete with a dual, granite countertop vanity and luxurious walk-in shower, both of which can be upgraded to create you dream bathroom. Every home offered by Scott Felder Homes has energy-saving features, and the Rockwood is no exception. Scott Felder Homes’ unique Zip System® sheathing is built right in with the walls of the home to provide exceptional protection against the elements. The result is a highly insulated home, improved air quality and lower energy and resource costs. Plus, every home built is tested by a third party to ensure energy efficiency, reducing the impact on the environment and your wallet. 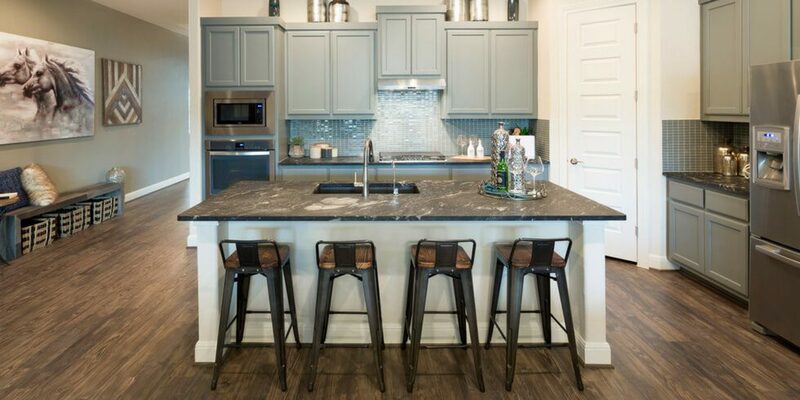 Scott Felder Homes is offering a variety of unique, energy-efficient floorplans at Homestead. Homes range from approximately 2,000 to 3,200 square feet and feature three to five bedrooms and two to five bathrooms. Situated on 65-foot homesites, prices start in the low $300,000s. The Rockwood model home by Scott Felder Homes opens for tours this July, so stay tuned for details! If you’d like more information on the Rockwood floor plan, or any of the homes offered by Scott Felder Homes at Homestead, contact Corinne Wall at 210-807-8244 or Mike Anthony at 210-899-3905. The other homebuilders at Homestead include Pulte Homes and CastleRock Communities. Make sure to join our Founders Club to receive community updates and to learn more about the homes, amenities and lifestyle at Homestead!